Every so often, we get a client request for an email signature template. Usually, the request comes with a vision of branded messaging that will shine brightly at the bottom of their email, much like the diamonds in a Bond flick. You might envision an image of yourself followed by your contact information in that font your company put so much effort into selecting, your social icons, an image of your business, one of your favorite quotes, and perhaps even a couple of association logos. These are all great, and so is the idea of a stellar email signature that renders perfectly every time. Unfortunately, you can't have it both ways. We live in a world with multiple email clients (Outlook, Apple Mail, Gmail, etc.) that all follow different code and security standards. We first need to set aside email signatures for a second and talk about MailChimp. The New York Times reported that MailChimp recorded $280 million in revenue in 2015 and is on track to top $400 million in 2016. Email isn’t monkeying around here. Essentially, they have made it easy for marketers to create good-looking, responsive emails. This is great for them—but the real magic is in its delivery. Chimp optimized its HTML and the back-end of the email to perform pretty well, regardless of the email client. Notice I said, "pretty well?" This is because there is no "perfect" in the email world. Fonts, images, links, and formatting are treated differently in every email client. Are you kidding me? A $400 million company can’t even get this 100% perfect?! Nope. The exact same rules that MailChimp are forced to follow also apply to your email signatures—but with an additional hurdle. Email signatures also have to be implemented inside your email client. This comes with its own set of rules and IT headaches. But wait... there simply HAS to be a way to have it both ways?!? Consider a case where a company uses Microsoft Exchange/Outlook. Company-wide email signatures are generated in the exchange management console. The script contains a set of variables that apply the user's information to a template. The template can be created in Plain Text, HTML or Rich Text and will require IT’s assistance to set up. Great! Let's assume that your IT person finally gets this set up 4–6 months after you put in the initial request. You will now have to live with the Microsoft “Rules of Email Signature Engagement.” This is where it gets real. Your brand calls for the Montserrat font. You use it on your website without a problem, so this means you can use the font in your signature, right? Wrong. Only about five email clients—most current-version—support these fonts. Even Gmail doesn't support their own Google fonts. What?! Your signature’s Montserrat font will probably be converted to Helvetica, Arial or Calibri—depending on the recipient's email client. Bummer, eh? And it goes beyond fonts. You also have a sweet picture of yourself and a logo in your email signature. For the most part, this is fine—but most email clients will see this as an attachment and a security risk. Users will have to “allow the image to be downloaded,” which means that, at first, they’ll see a little red “x” in a tiny box instead of your pearly whites. Aw, man. Even further, email signatures are set up in old-school tables. These table cells need to have very specific height and width attributes in order to make your signature look super clean and awesome. This is fine... assuming the font and its attributes carry through to the recipient's client. Once the font changes and becomes a slightly different size, you’ll generally end up with some major formatting issues. Broken tables are really ugly. Microsoft also only does a semi-decent job turning an HTML table into a Microsoft-formatted table. Microsoft Word tables don’t even translate well into Outlook. Way to go, Microsoft. Now, some of your users use Apple Mail on their iPhone, some have Androids, a couple people have Windows phones, and one guy has a Blackberry. This is a whole new can of worms. But let's not get into this right here... that's a topic for another day. Wow. This sounds like more work than my website. What's the solution? Okay! This is simple. Don’t fall into the email signature trap. 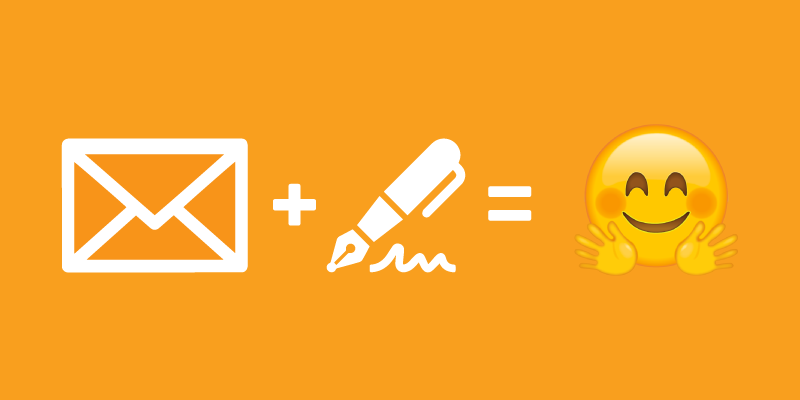 Your email signature will be best served up the way your company’s email client prefers. This is generally a clean email with your logo and your contact information created in your email client’s signature tool. Well darnit, I want more! TIS can create an HTML template for your system, but it must abide by the standards of both your email client and the rules of most recipients. This generally means it’s not worth the trouble. Half of your clients will end up with a broken brand. We will probably need to get IT on board. There are some companies that serve up email signatures in a similar fashion to MailChimp—like Wise Stamp, which allows you to pick a template that best fits your brand. You can then drop your text and images into the chosen template, snag their code based on your company's email client and plug it in. While convenient, you will be limited to the options available from Wise Stamp—and it won’t come cheap. A medium team of 25 users can cost $42 a month billed annually. That’s pretty expensive for an email signature that doesn’t allow you to design the signature to your standards! So I suppose I should spend my marketing money on something more useful. I would. I’d rather spend my marketing money on some solid email campaigns in MailChimp than worry about my email signatures. Keep it simple, clean and classy. Your clients, IT department, staff, and Spam box will be much happier.